While meditating the other day, I saw that I concentrate more on negative comments said to me than the compliments I’ve received. I learned that by replaying the nasty statements repeatedly in my mind, I increase the power these harsh words have on me. And now’s the time for me to break this habit. 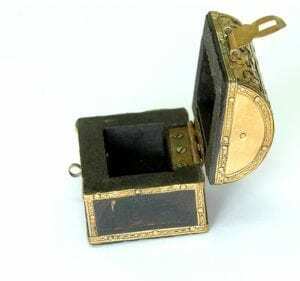 As I sat in silence, I had a vision of a gold-colored treasure box, perhaps three inches square, lodged near my heart. It was corroded, discolored and bulging. All that held it together was a strained latch. Fluid seeped from the gap between the lid and box. Once, the box had been beautiful. I saw the outline of a peaceful pastoral scene, one with a shepherd and flock. Now, the container could sit atop a trash heap and no one would notice it. The notion occurred to me that this delicate container was supposed to hold the good deeds I’d done and the contributions I’ve made in my life. A resource to fuel me when times were tough, to help me realize that I do make a difference. And, I’d destroyed it. I prayed for Great I Am’s assistance to have the box extracted from me and to help me completely release the darkness’s grip on me. I visualized the container being freed from my body and hurled into an open field, where pure, white-neon light bombarded it. Eventually, the brightness absorbed the decaying box and it vanished. I asked the Creator to send love to all of those who voiced those derogatory comments, even though they may never find it in their hearts to return kindness to me. From now on, I resolve not to cling to the negative as bullies would want me to. I will not question myself or diminish my self-worth. I will keep on my path. I will hold dear the compliments and gratitude I receive from others. And, when a day gets gloomy, I’ll tap into those niceties to bolster me, to strengthen me onward. We all encounter people who are unkind to us, who say or write hateful words only to inflict pain. Let’s resolve to let their spiteful sentences roll off our shoulders like rain drops beading up on a Gore-Tex jacket. And let’s keep a stash of compliments nearby to bring us back to equilibrium.